Just a quick update on the babies before signing off for weekend activities. 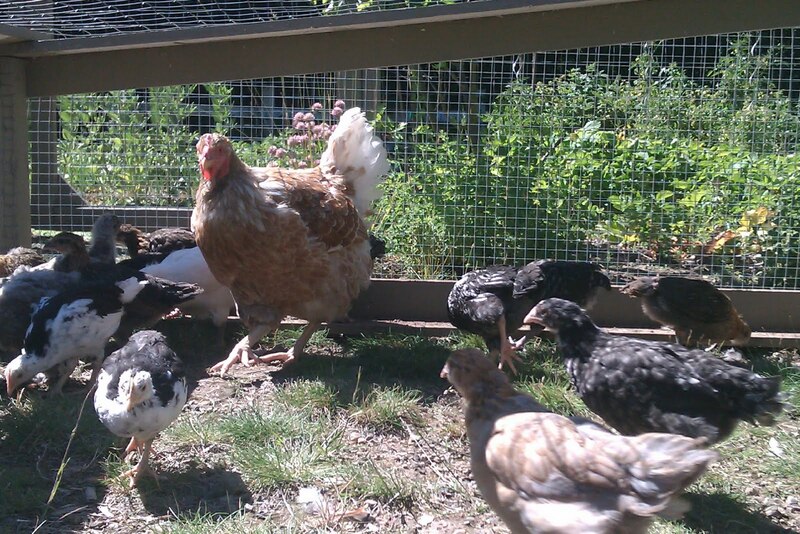 When the chicks were a couple of weeks old, I moved their “nursery pen”, which is inside the coop, in front of the door to the chicken tractor, creating a larger area for them to explore, and giving them access to the outdoors (but still keeping them separate from the big girls). They’re loving being outside where they can sun and dust bathe, and chase bugs, and they quickly learned to respond to the rooster’s alarm call, and will dash inside at the first sign of trouble (with Reepicheep standing guard at the door). I think they’re going to be a lot more predator savvy than our first batch was in the beginning. Now that they’re five weeks old, they are starting to look more like their future adult selves, and this week we had a revelation about what breeds we actually have. It turns out that one of the girls we thought was a bonus Americana is actually our Silver Laced Wyandotte, and the one that we thought was the Wyandotte is actually a third (bonus) Ancona, and judging by the size of its comb, it’s a boy. We still can’t tell whether our Cochins (which were straight run, not sexed) are male or female yet, so I’m a little worried that we could end up having three extra roos on our hands, but I’m actually quite excited about having an Ancona male. Aside from being absolutely gorgeous, they’re alert and vigilant watchdogs, and could prove to be an excellent choice for breeding should we decide to go that route next time (Anconas are prolific egg layers, unlike Faverolles and Cochins, who we chose for their charm and good looks). I’m hoping to try introducing them to the older flock in the near future, fingers crossed that they’ll be accepted with open arms/wings.